That's a pretty strong start there with all three components making an appearance. If you know me, then you know my spoon headed right for that pile of graham cracker swirl.... ooops, it's a bit much all by itself, I need to spread the graham flavor out a bit more next time. I had hoped the marshmallow swirl would be the same as One Sweet World and it is. I wish they would have also stolen the fudge chunks from there as well because I think it would help tweak this one a little bit. 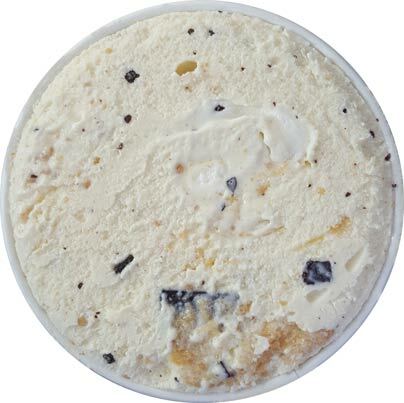 Look, it's a tasty ice cream, but I can't get over this nagging feeling that something is missing. If you want, blame it on the fact that I've had way too many graham based ice creams. Or to put it more simply, blame it on the fact that we aren't used to something like this. It's not hard to throw the #easyscooper and #funfactor hashtags on this homage to a Moon Pie. The more I scooped, the more I wanted to continue. It was hard to put the lid back on this one. Lots of people should enjoy this, especially anyone who thinks a chocolate base can overpower a S'mores ice cream. If you don't mind the higher price tag, give this one a try. On Second Scoop: So yeah, I was tempted to turn the last 60% of the pint in to one big serving because I hit this spot that was like 20% ice cream and 80% mix-ins. Yes it wouldn't hurt if the base was flavored differently, but I'm still having plenty of fun with this flavor. I like that B&J's is amping up the amount of mix-ins and I'm going to keep pointing it out because I don't want them to stop it. Give this one a shot if you don't mind paying a bit extra. 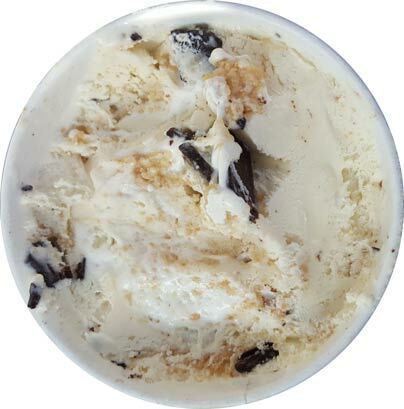 What were they going for here, a S'mores ice cream with a vanilla base, or a Moon Pie ice cream? I am guessing the latter since "Moon" is in the name. Did you buy the pint at a scoop shop? Paid 7.50 for this flavor thanks to uber delivery. Marshmallow and graham cracker swirls were excellent. Fudge chunks were decent, better at least than fudge flakes. But I think the flavor really needed a more interesting base than vanilla. I was getting bored and started digging out just the swirls halfway through. Marshmallow base, maybe? But even the vanilla bean or vanilla malt bases B&J have would’ve been better. Overall good flavor, mighty rebuy as a regular flavor but won’t be sad to see it go. Interesting idea, but you're going to do a limited flavor I would want something more creative than this? This feels like something I could find a version of in any store because it's so similar to S'more. Maybe they didn't want to create something so popular that it caused some weird ice cream riot? I think proceeds go to charity, though I don't know what percent, but at least that makes the inflated price seem less wasteful. @RG: Sorry, I forgot (but will add) a charity link in the review, but I'll take a wild guess that $2-$3 is NOT going to charity for each pint. Probably more like 20-30 cents maybe? Who knows. Never been to a scoop shop. Is it really $6.50 for a scooped pint? Seems like a decent S'mores/Moon Pie flavor but paying over $20 dollars for one pint through shipping isn't realistic to me. Finally received my online order of this flavor and I loved it! First of all, I was surprised about the fudge chunks. They were obviously thicker than flakes but they weren't as thick and rich as the chunks found in one sweet world and phish food. I think vanilla was the right choice for the base because while kind of boring alone it allows for the flavors of the mix ins to really stand out. The texture of the graham swirl was great! As far as the marshmallow was concerned, maybe it was just the pint I had, but I thought there could have been a lot more of it. 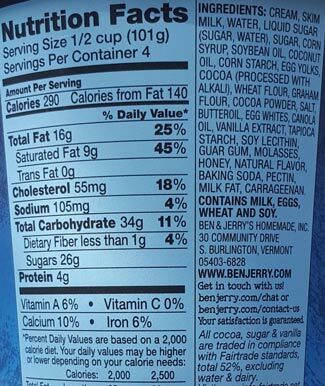 Overall one of my favorites from ben n jerry's. Ordered 3 pints! Good idea definitely have to compare them! There's a scoop shop in my town, so I felt very fortunate to have bought 4 pints of this stuff a few months ago, and I regretted nothing. Both the marshmallow and graham swirls were sheer perfection in overall execution (flavor, texture, and abundance) so it made up for the boring vanilla. I agree with the user who said a vanilla malt base would've been better, but I was still sad to see it go. 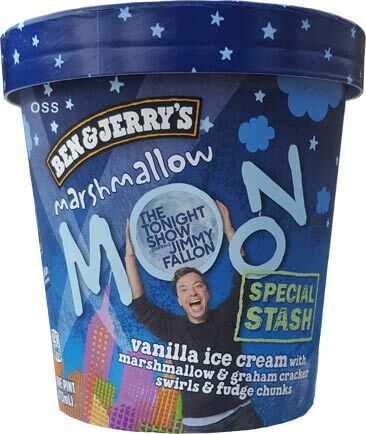 I think 2 scoops of this, and one scoop of Ben & Jerry's S'mores would make the perfect "S'mores Sundae" because BJ's actual s'mores flavor is way too chocolatey, while Marshmallow Moon could've used some more chocolate. But I never attempted that, because the first (and last) time I had BJ's S'mores, it did NOT agree with my insides at all, and that was only after a half of a pint. 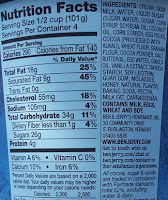 So I can only presume the cocoa content was so high that the caffeine levels were analogous to black coffee. At least they will utilize the marshmallow swirl again in "Chocolate Shake It". Can't wait to read your review of that one.